Deepening regionalism in Asia demands new leadership. Strong elites who are committed to a supranational identity are a minimum requirement of successful regionalism. Regional leaders are increasingly seen as a new set of leaders in Europe. Currently, Asian regional leaders largely come from the diplomacy community, or trade and economic sectors. Yet further regionalization demands a new type of leadership from civil society and citizens. In this context it is important to cultivate new regional leadership through the development of regional citizenship. This book examines contested ideas of regionalism in Asia with a particular focus on two competing ideas of pan-Asianism and Pacificism. It also identifies a new trend and contestation, the fundamental shift from a civilization understanding of regionalism to a technocratic and functional understanding of regionalism in the form of regulatory regionalism. 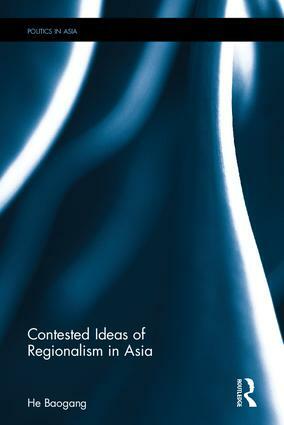 It also examines the other contested imaginations of regionalism in Asia including elitist versus participatory approaches to regionalism, and democracy-centric versus nationalism-centric approaches to regionalism. Baogang He is Professor and Head of Public Policy and Global Affairs at Nanyang Technological University. He is also Chair in International Studies, Deakin University, Australia. This series will publish philosophical, theoretical, methodological and empirical work by prominent scholars, as well as that of emerging scholars, concerned with IR theory and practice in the context of Asia. It will engage with a wide range of issues and questions ranging from meta-theoretical underpinnings of existing Western-oriented IR theories to ways of theorising Asian histories and cultures. What are the implications of the rise of Asia, and especially China, for IR as a discipline? Through what mechanisms has Western IR theory dominated the discipline? Why has IR, as a discipline, developed the way it has? What are the distinctive features and teaching practices in Asian IR communities? To what extent is Western IR theory useful in comprehending Asian international politics? Do developments in contemporary Asia require new theoretical and methodological innovations? Is the development of an Asian theory of IR desirable? If so, how might it be achieved? Will efforts to develop Asian IR theory or schools lead IR to becoming a fragmented field of study?